Of course I happen to think so (just like Serbs thing that Serbian is easy, arabs think Arabic is easy, and Chineese think Chineese is easy). But, I got this in the e-mail today and thought I would post it. What do you think no?? 19) I had to subject the subject to a series of tests..
21) The archer shot an arrow from his bow to the bow of the ship. Just in case you don’t know it, the Tour de France (pronounced Tour day France for all of you Bob Roll fans out there) started today. What?! You don’t know the difference between the yellow and pokadot jersy? 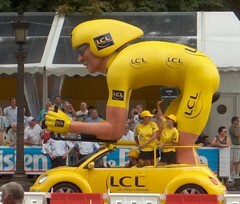 Take a look at this page on the basics of the tour de france for more information.